LucasFilm has given us the first teaser for The Last Jedi and I have to say that I am impressed. 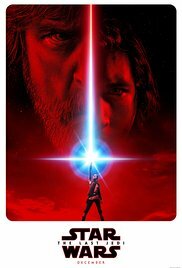 Director Rian Johnson has big shoes to fill and has never had a film that was this big in scope. The man is a talented director and, from the looks of it, he is going to make a fine addition to the stable of directors that LucasFilm has been obtaining over the years. This teaser stands out more than the one for The Force Awakens did this same time two years ago, but there isn't the sense of awe that The Force Awakens had. Everyone I know is pumped for this film, as am I, but I hope that coming trailers quench my thirst for Star Wars. Rogue One, while a good film but not a great one, left a bad taste in my mouth. After The Force Awakens, which gave hope for the series, Rogue One showed that the people running LucasFilm don't have as tight of a control that they led us to believe. Marvel has a tighter ship than LucasFilm does. Still, I am excited to see The Last Jedi. I think that the film looks good and there is enough talent behind this film that it will be hard to be bad. The Last Jedi stars Daisy Ridley, John Boyega, Mark Hamill, and the late Carrie Fisher. As I said before, the film is being directed by Rian Johnson, who also wrote the screenplay. The film hits theaters on Decemeber 15th.